In Windows, there are several ways to enable/disable any program or application from the startup which means the application won't load when the system starts up decreasing your bootup time and usage of other system resources. Few of the ways are, place a program shortcut in the startup folder or simply enable/disable any application from the msconfig utility which you can open via the run box. And now, if you are using Ubuntu and not sure how to change the applications from the startup, this tutorial explains it all. 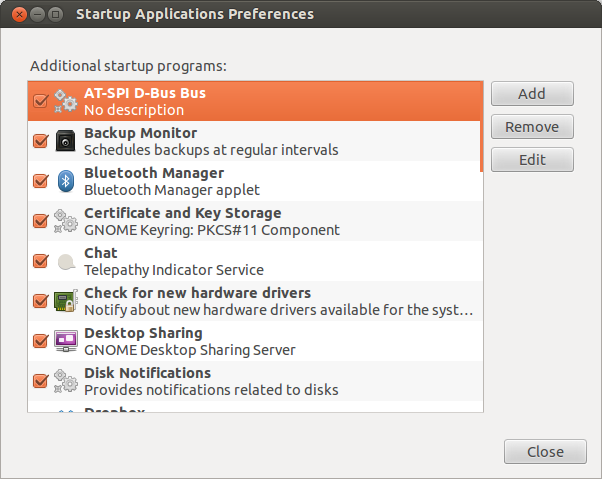 Like Windows, Ubuntu too has a lot of ways to manage the startup applications. Lets discuss them all one by one. 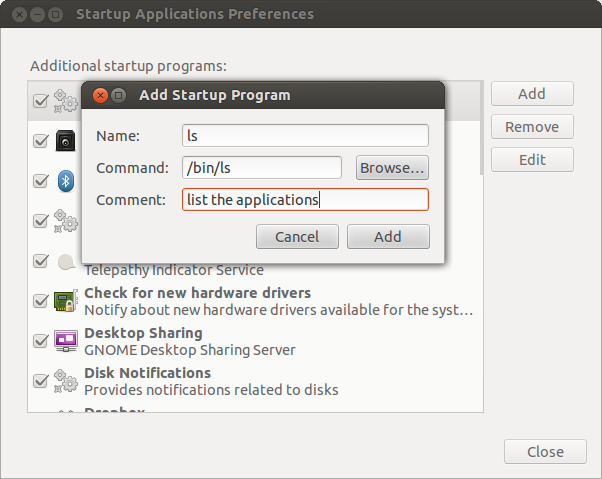 Use the following command from terminal to display the Startup Applications Preferences. A window will popup revealing the list of applications enabled/disabled at the startup.To make any changes, simply check/uncheck to enable/disable any program or application from the startup. You can also add or remove any application from the startup list. To remove, simply select the application and click on remove and to add any application, you need to know the proper path of the executable of required application. Normally, you can locate the path of executable using the which or whereis command.Let me explain you with a simple example for ls command. Once you know the path, simply add it like this. If you don't find the terminal quite user friendly, the same task can be performed using the graphical interface. 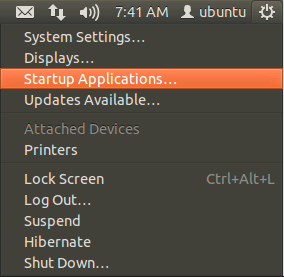 Considering you are using Ubuntu 12.04 LTS with default Unity desktop environment, simply go to dash home and search for keyword "startup" and open the Startup Applications. Its the same application you opened using the command gnome-session-properties. Now, make changes as required. But, the Startup Applications doesn't always appear in the dash home search bar. In that case, instead of trying in the dash,try the other side. On Ubuntu 12.04, it can be found in the menu you use for logging out and shutting down, the one with the cog icon. Besides this, there are a lot of application that don't appear in the Startup Applications menu by default. To enable viewing those hidden application, perform the following. Now, when you open the Startup Applications, you will see a lot more applications that were hidden earlier. Make changes as per required, but make sure you cross check before making any changes there. You might get stuck or end up with some sort of system failure if you disable some application required at the startup, some of them being Files, Network, etc.